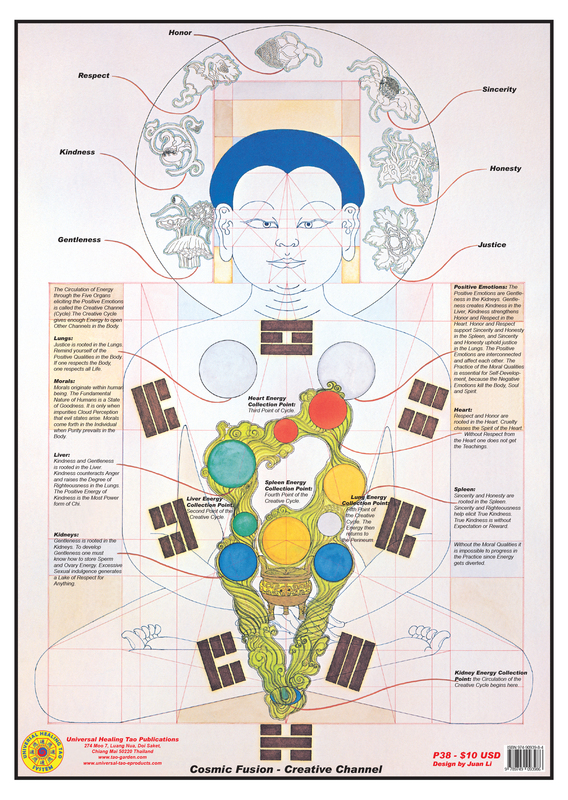 This poster illustrates the Male Body with the Creative Channel with the detail explanation surrounding figure of the Positive Emotions and their Vital Organ Relationship, beautifully illustrated by Universal Healing Tao Senior Instructor Juan Li's original meditative art drawings. Through the techniques of Fusion II you are opening your body to the Universal Forces of the Earth (Mother-Blue Energy), Heaven (Father-Violet and Red Energy) and Atmospheric Level (Human-Cosmic and Golden Energy). The Cosmic Fusion practice builds on the foundation Inner Alchemy (Changing One Substance into Another) established in Fusion I nurturing the vital organs with the Golden Compassionate heart throughout the Three Bodies (Physical, Energy and Spirit).